I think the LaunchKey Mini MK2 overflows on CC messages from the knobs. I think it should be taken off this list, unless someone can post a patch that doesn't crash when you turn the knobs at any decent speed. I would be happy to verify. 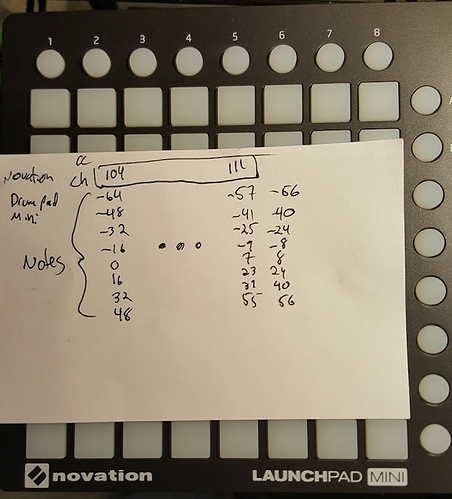 I can confirm the Novation Launchpad Mini has partial functionality. The bug I found was fixable by modifying the Axoloti Midi code. I've updated the object and the code is in the repo. This device has only 1 configuration. No registered class for this device. Nektar Impact LX61 works like a charm. Any experience with Faderfox? Thinking about UC4 model. Kawai ES6 Digital piano working. What about connecting usb devices as mouse and PC keyboard? Which kind of information do they manage? Haven't had time to read this entire thread, but if anyone has one of those AKAI USB MIDI Mixers, I'd really love to know whether Axoloti is able to switch the button lights on/off on demand. later down on the post, it seems some have got it working. now, you don't mention which model... so hard to say if this is relevant or not (best to be specific when you want to know about particular device) ... you should follow up on the above thread, if you want more details. Cheers Mark, I was just referring to the one called MIDIMIX, the same one Matt used in that recent video of his. As far as I can tell, it works, but I noticed there were no lights in use. Reason I ask is because having eight buttons below three sets of knobs would make it a great device for a step sequencer, but unless the lights can be turned on/off on demand by an Axo patch, there would be no way to have the lights indicate the step position, or which notes are active etc. Arturia KeyStep confirmed working. If anyone has one, there's about 3/4 inch of headroom underneath the touch strips--enough to fit an Axoloti core sans-midi! Is it possible that the M-Audio Keystation61 is not compatible with it? I have no problem using the axoloti with my QX49, but I don't get anything with my Keystation. @William my Keystation61es works perfectly with axoloti. I suggest getting MidiOx to test that you are getting midi data from the unit? Tried with my Google Pixel Android phone as a USB device and it works. I tried very quickly with an app called Midi Keyboard (here: https://play.google.com/store/apps/details?id=com.mobileer.midikeyboard&hl=en). Plug your phone to the Axoloti (big USB port). Then you have to choose "Use device as MIDI" in the Android System USB notification of your phone. Then, in the app, in the "Receiver for keys" menu, choose "Android USB Peripheral" and it should work. I simply plugged it into the axoloti core, using a usb, powered on the digital piano, connected the axoloti core to my computer, and then opened the axoloti app. The first time I plugged it in and got it to work, the above message printed. However, subsequently I did not receive this lengthy detailed message about the midi controller, but it still works. Can anyone explain to me why I do not get the detailed message (or if you need more info to answer my question)? In any case, I'm happy it works. I was able to create a basic synth to test that my digital piano was properly communicating to the axoloti core.